2018 Dziuban Award Recipient – Matt Dombrowski, M.F.A. The Center for Distributed Learning (CDL) has awarded the 2018 Chuck D. Dziuban Award for Excellence in Online Teaching to Matt Dombrowski, from the School of Visual Arts and Design. The award presentation occurred during the Showcase event that concluded the fall session of CDL’s faculty development program for online and blended teaching, IDL6543. Along with winning the award, Matt Dombrowski received a $1,000 travel award for professional conference participation. The Dziuban Award is a peer-reviewed selected honor. The award committee consists of several experienced online faculty at UCF. The committee also recognized two Honorable Mentions: Jessica Waesche from the Psychology Department and Sandra Sousa from Modern Languages and Literatures. 2018 Dziuban Award Winner Presentation (left to right) Kelvin Thompson, Executive Director, CDL, Matt Dombrowski (2018 Award Winner), Amanda Groff (presenting the award), and Rudy McDaniel, Director, School of Visual Arts & Design. 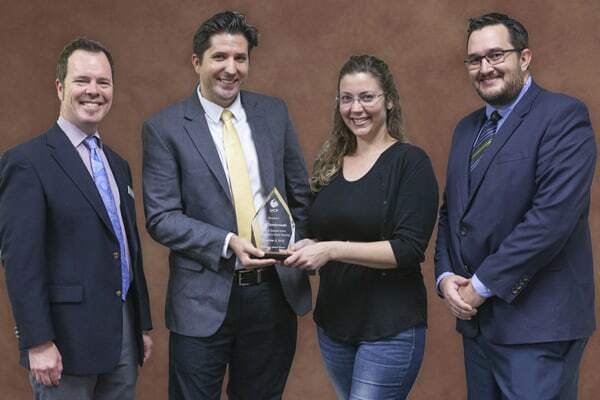 Named after UCF’s Chuck Dziuban, the award recognizes one outstanding UCF faculty member who submitted the strongest evidence-based case for exemplary online teaching and whose course recently received a High Quality online course review. Dziuban is an internationally acclaimed leader in online learning and, among many other recognitions, was named UCF’s first Pegasus Professor and is currently a Professor Emeritus. View past Dziuban Award Recipients.